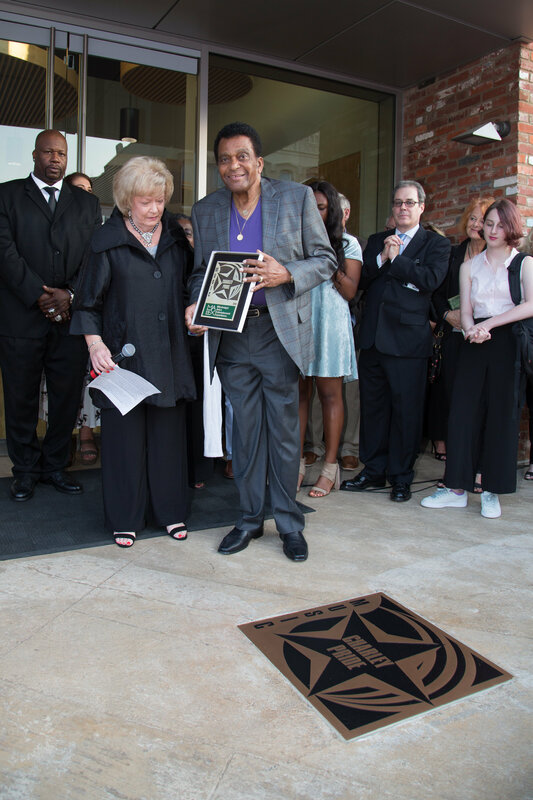 Country Music Hall of Fame member and Mississippi native Charley Pride, was honored with another industry accolade recently, as a member of the Mississippi Arts + Entertainment Experience Hall of Fame class of 2018. On Aug. 25 in Meridian, Mississippi, Pride was honored along with four other recipients; singer-songwriter Jimmy Buffett, photographer William Eggleston, writer and editor Willie Morris, and blues musician Howlin’ Wolf. Pride also received a “Walk of Fame’ star as part of the ceremony. Pride was born in Sledge, Mississippi. By age 14, Pride had spent nearly a year saving his money to purchase his first guitar—a Silvertone model from Sears & Roebuck. In 1966, Pride was signed by Chet Atkins to RCA Records. To date, Pride has received three Grammys, three Country Music Association awards, an Academy of Country Music Pioneer Award, Country Music Hall of Fame and Grand Ole Opry inductions and a Recording Academy Lifetime Achievement Award. His 52 Top 10 hits include “Is Anybody Goin’ to San Antone,” “Mississippi Cotton Picking Delta Town,” “Burgers and Fries,” “Roll On Mississippi” and others. The 18 other Mississippi artists inducted into the Hall are: painter Walter Inglis Anderson, writer William Faulkner, actor Morgan Freeman, writer John Grisham, puppeteer Jim Henson, bluesman Robert Johnson, actor James Earl Jones, bluesman B.B.King, potter George Ohr, entertainer Elvis Presley, opera singer Leontyne Price, musician Jimmie Rodgers, bluesman Muddy Waters, actor Sela Ward, writer Eudora Welty, playwright Tennessee Williams, entertainer Oprah Winfrey, and writer Richard Wright.